I was recently the head emcee and judge for a food festival in Eugene, Oregon and the chefs reminded me of a simple technique that packs tons of flavor into our vegetables, charring! 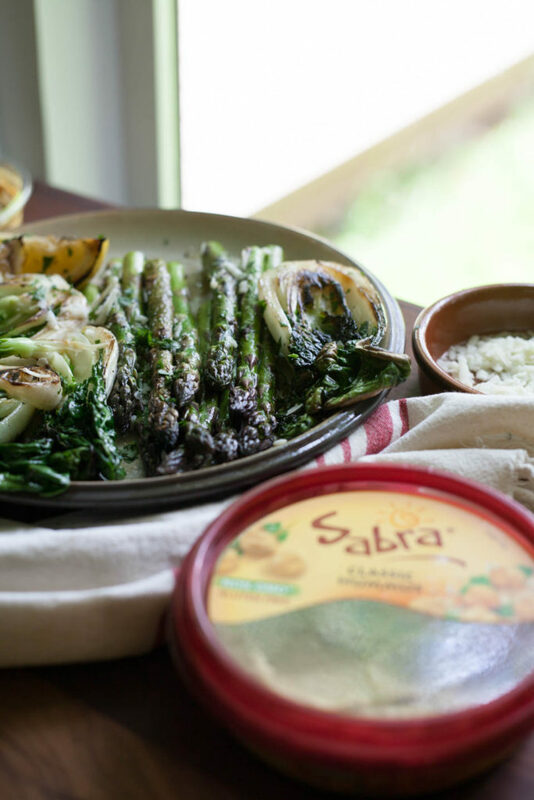 It was funny to me because I had already had this recipe ready for Sabra National Hummus Day but I had to add the greens to the charred vegetable platter to make it that much better. I love quickly charring vegetables over fire or in cast iron pans for a quick and easy way to cook! And I do this pretty much with whatever is in season. But one of the chefs was charring a head of butter lettuce cut in half and that reminded me of charred these awesome baby bok choy for hummus dipping greatness. Love! You can grill/char any sturdy lettuce to give it a different flavor and texture. You know I love me my vegetables, the more the better in my opinion. 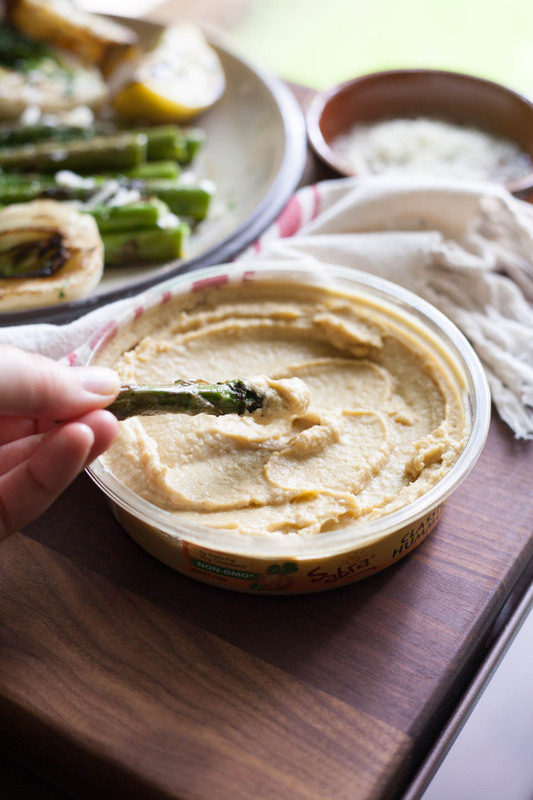 So grilling these for a quick, literally takes minutes, super healthy snack, appetizer, or side dish serves with our favorite Sabra hummus is a no brainer for me. 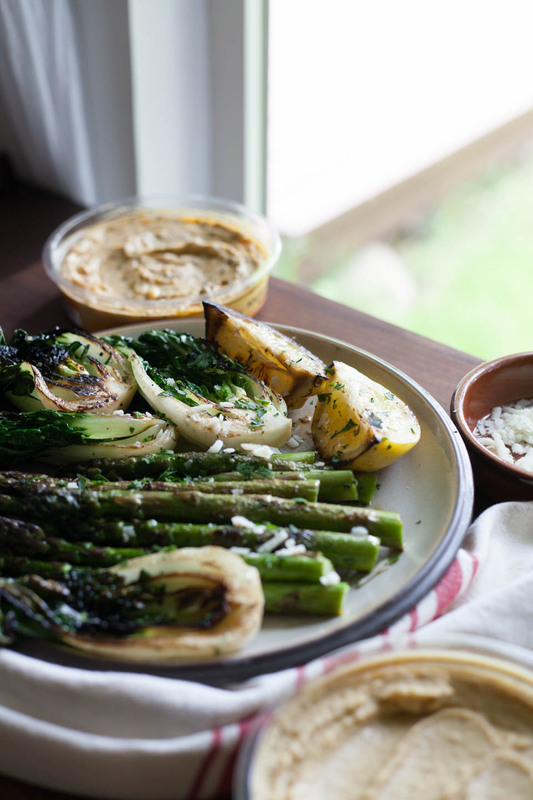 Make this beautiful plate of vegetables, serve on a cutting board for an even easier dish and enjoy while you get the rest of dinner ready. Great for camping, outdoor parties, or when the family gets home from a long of school and work, have a healthy snack on hand for everyone to enjoy together while you talk about your day around a plate of yummy healthy food. 🙂 That is perfection to me! Celebrate with Sabra Hummus for National Hummus Day, May 13th! Take pictures of your unofficial meal and tag @sabra @notjustbaked #sabra #unofficialmeal so I can see what your eating :). I made these by grilling and charring in a cast iron pan, either work great for adding flavor to your vegetables. 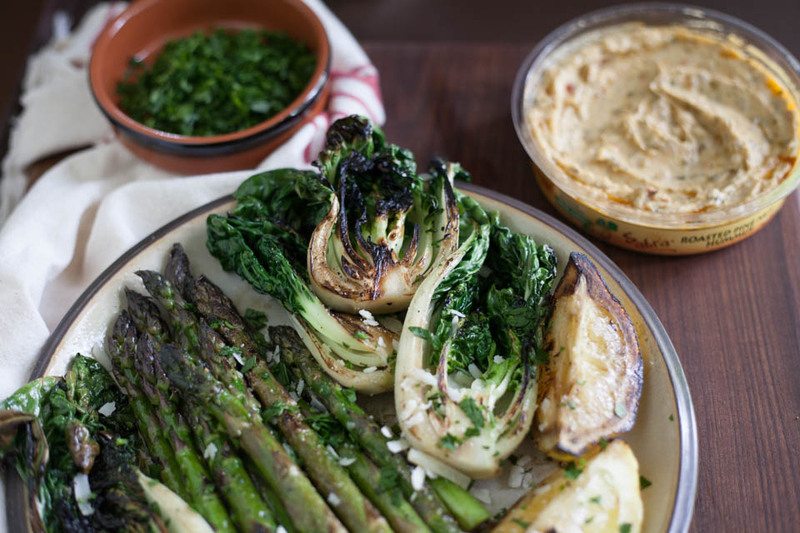 Toss asparagus, bok choy, and lemon in olive oil. Sprinkle with a pinch of salt and pepper. Cast Iron: Heat 1 tablespoon over medium hight heat in medium cast iron pan. Once shimmering, add asparagus and char on high heat for 3 minutes, turning a few times. Remove and place on a plate. Add lemons and char for 2 minutes, turning to cook each side. Add bok choy cut side down, char for 1 minute, turn and cook 1 minute. Remove and place on plate. Grill: Heat grill to high heat. Once grill is hot, place vegetables and lemon over high heat. Cook, turning once, for 3-5 minutes. Remove and place on a large cutting board or plate. Squeeze 1/2 lemon over charred vegetables. 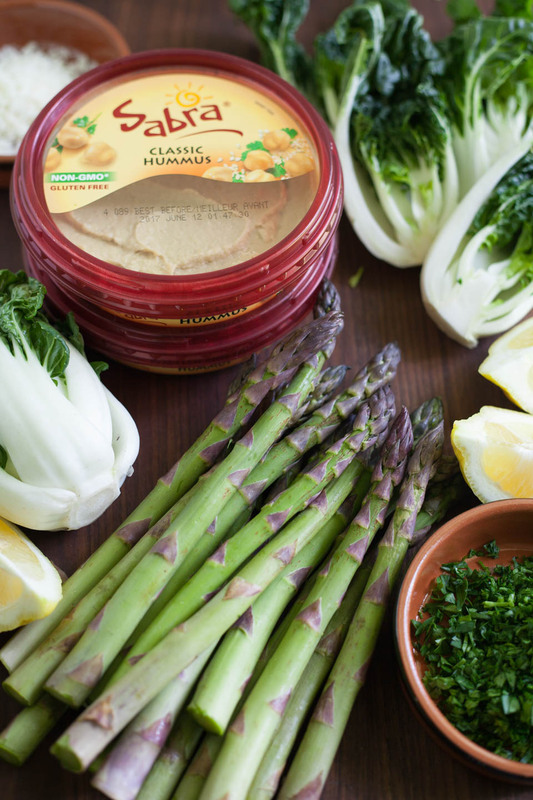 Sprinkle with fresh parsley and parmigiano reggiano cheese, serve immediately with hummus and enjoy. Disclosure: This is a compensated post in collaboration with Sabra Hummus for National Hummus Day. Thank you for supporting the brands that support NJB! As usual all opinions are my own. Thank you!